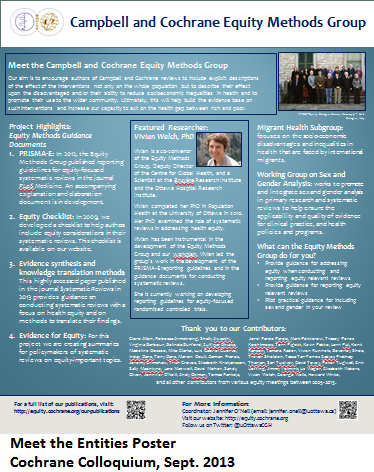 The Campbell and Cochrane Equity Methods Group is registered with both the Campbell and Cochrane. It was first registered as the Cochrane Health Equity Field and the Campbell Equity Methods Group on the 27th of June, 2005. We aim to provide advice to the various entities (including the Steering Group, Collaborative Review Groups, Fields, Methods Groups, and reviewers) regarding equity methods policy. We are developing an equity chapter for the next major revision of the Cochrane Handbook. This will include recommendations on formulation of the question, collecting data, interpreting evidence across factors such as socio-economic position and gender, and discussing the implications of research findings for clinicians, consumers, and policy-makers. In 2012 we published an equity extension to the Preferred Reporting Items for Systematic Reviews and Meta-Analyses (PRISMA-E 2012). In 2013 we published guidance for heath equity evidence synthesis and knowledge translation methods. We provide training and review support to systematic review authors interested in including equity considerations in their review. We present and facilitate workshops and presentations at national and international conferences, including both Cochrane and Campbell annual meetings. Some training activities are conducted in cooperation with other methods groups, given overlapping issues such as statistical power and subgroups, qualitative methods, economics, and non-randomized studies that need to be addressed in equity reviews. We conduct empirical methods research on what equity data are needed in Campbell and Cochrane reviews and how to apply reviews for evidence-informed equity-oriented policy. We conduct ongoing surveys of reviews, to examine how effective the reviewers have been at including and conveying equity issues in the reviews. Co-Convenor Vivian Welch's PhD thesis focused on assessing how effects on health equity are considered in systematic reviews. Our communication strategy includes a listserv, a website, and printed/electronic newsletters. Our listserv is used to promote awareness of the Campbell and Cochrane Collaborations to Methods Group members, to update members on Methods activities, and to encourage collaboration and involvement. We produce newsletters twice yearly, with email updates sent as appropriate. We hold Open Equity Meetings at the annual Cochrane Colloquia and the annual Campbell Symposia, which are well-attended by both past collaborators and new colleagues. These meetings facilitate the interaction of members. The coordinator and convenors attend the annual Cochrane Methods Board meeting. All of our convenors are actively involved in the leadership of the Campbell and Cochrane. Mark Petticrew serves on the Editorial Board of the Cochrane Public Health Review Group. Peter Tugwell was the Coordinating Editors Representative on the Cochrane Steering Group from 2004-2008, and is currently serving as the Co-Chair on the Campbell Methods Group Advisory Committee. He is also a member of the Campbell Steering Committee. Vivian Welch is Co-Convenor of the Agenda and Priority Setting Methods Group.